My father-in-law loves the Hallmark Channel. It kind of has become a bit of a family joke. Every time we visit Matthew’s family, you can bet the Hallmark Channel will be on. Honestly, I have never really watched much on Hallmark Channel. Until recently. You see, The Hallmark Channel asked if I would want to blog about the second season of its hit show When Calls the Heart and I said yes. I hadn’t seen the show before, but I was looking for a new show to check out and the fact that it was only one season in was appealing to me. Also appealing? Lori Laughlin (AKA Rebecca from Full House) is on it. He received a flood of text messages of how good the show is and how they couldn’t wait for season 2 on April 25th. I popped in the first DVD and was hooked. After just two episodes I called Matthew’s dad to tell him that I was loving When Calls the Heart and he was like, “That’s a great show. Just great. You should check out…” and then he went on and on about several other Hallmark Channel shows. When Calls the Heart is about a teacher named Elizabeth Thatcher who comes from an affluent family and leaves all she knows to teach in Coal Valley, a small coal mining town. The townspeople and stories are charming. As I shared yesterday, I am a HUGE fan of Anne of Green Gables and When Calls the Heart has a similar feel. It’s just lovely. 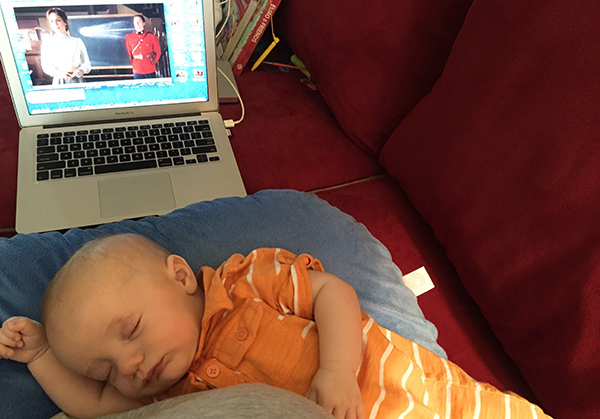 I looked forward to every feed with Ezra so I could watch more of the show – ha! Matthew just grins and shakes his head. He doesn’t realize what he’s missing. Do you watch The Hallmark Channel? Have you seen When Calls the Heart? Check out the Season 2 premiere this Saturday at 8/7 central. This post is sponsored by The Hallmark Channel. Connect with The Hallmark Channel on Facebook and Twitter. Affection for my father-in-law and When Calls the Heart all my own. 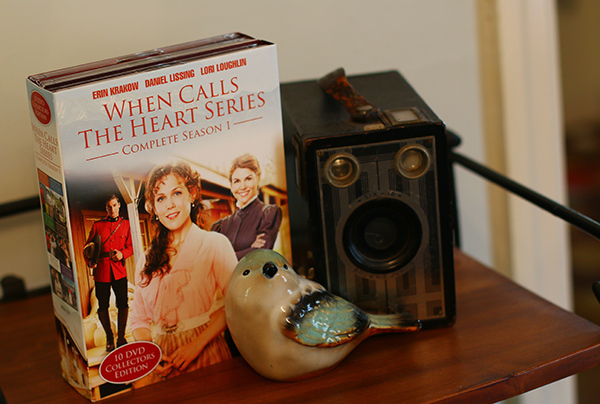 I’ve read the “When Calls the Heart” series by Janette Oke. VERY GOOD; highly recommend the books. I haven’t seen the show though … would be interested in seeing if they stay true to the books. Thanks for sharing! I WANT to be a Hallmark Channel addict, but we have U-verse and they don’t offer it in our area. I tried to find When Calls the Heart last year when it premiered. Sigh. I guess I will just have to watch it on DVD — or maybe streaming? Is it on Netflix or Amazon? I haven’t seen When Calls the Heart yet but I love the Hallmark Channel and I love shows like this so I’m totally going to have to set the DVR. Aha it just hit me – the main character was in Army Wives! ANd I do love Jack Wagner! I love When Calls the Heart. I read the books as a teenager and love watching the show. My daughter and I love the Hallmark Channel. It’s one of the best channels for family friendly shows. I want to watch this so badly!! I LOVED the books!! Mr. & Mrs. Miracle (two separate shows) based on Debbie Macomber’s book the same name are movies on this channel. I’ve only seen a little of the movies but I absolutely love the books. I love the Hallmark Channel as well – especially during Christmas time. Unfortunately, AT&T U-verse doesn’t carry it.